(By Whitney Webb of Trueactivist.com) Since 2008 economic crisis, homelessness in the United States has been on the rise, particularly in cities and urban areas. Though most local and city governments are well-aware of the issue, many have decided to criminalize the homeless instead of working to alleviate their hardships or resolve the underlying problems which contribute to the phenomenon. Not only that, but many have also sought to criminalize those activists and good samaritans who offer food and services to the homeless when over-burdened homeless shelters and food pantries cannot. This past Saturday, activists in Tampa, Florida experienced firsthand the unpleasant consequences of lending a much-needed hand to the local homeless community when they were arrested for offering free food in a public park. Members of Food Not Bombs, a group that shares free vegan/vegetarian meals in protest of war and poverty, had gathered in Lykes Gaslight Park to offer the homeless hot coffee and bagels as winter temperatures began to take a turn for the worse. Though there was no violence, illicit substances, or bad behavior of any kind, the gathering was considered illegal by Tampa authorities. Though it is not explicitly illegal to feed the hungry in public in Tampa, one must have a special and costly permit from the city government in order to do just that. The permit allows groups or individuals to feed the homeless twice a week, but – in addition to the cost of the permit itself – the city also demands one take out a specific insurance policy, which can be prohibitively expensive for many would-be activists. Tampa, Florida has a history of clamping down on those who seek to share free food and necessities with the homeless. Over a decade ago in 2004, three activists with Food Not Bombs were arrested for feeding the homeless. In 2011, members of a local church were also warned not to feed the homeless. This case, in particular, drew scrutiny at the time as it was largely suspected that Tampa’s city government was looking to “clean up” downtown before the 2012 Republican convention was set to be held there. Another Florida town, just 40 minutes south of Tampa, is also well-known for its poor treatment of the homeless. 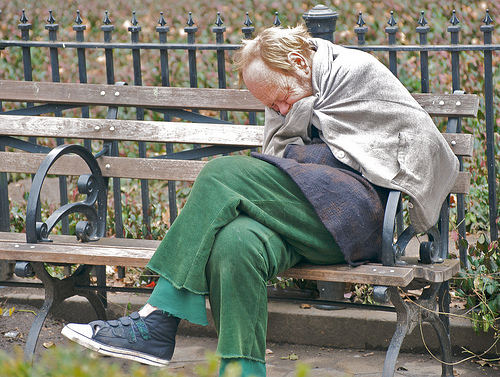 Sarasota, Florida has repeatedly topped the list of meanest cities for the homeless due to city ordinances criminalizing sleeping in public or private places, which essentially criminalizes the very existence of the homeless. However, the poor treatment of the homeless and those who seek to help them is not just a problem in Florida but a national one. The priorities of city governments throughout the country all too often ignore the most marginalized and the most voiceless among us. Though some cities are trying to reverse this trend, activists such as those working with Food Not Bombs must continue to lead by example in order to expose the immorality of banning acts of basic human kindness.